In a bowl, mix the flour and the baking powder. In a bigger bowl, beat the butter and the sugar. Add the egg and beat some more. Gradually incorporate the dry ingredients while beating to reach a homogeneous texture. Shape a ball and divide it into three parts. Flavour each ball and adjust to taste. Keep in mind that oils are volatile. Once the cookies are baked, they will be more discrete. Shape each ball of dough in a 5 cm diametre roll . Wrap each roll separately in aluminium foil (or wax paper) and twist the ends. Refrigerate until the dough is firm, approximately 1 hour. Preheat the oven at 350 °F. Grease a baking sheet. Slice the rolls into 0,5 to 1 cm thick cookies and place them on the baking sheet. 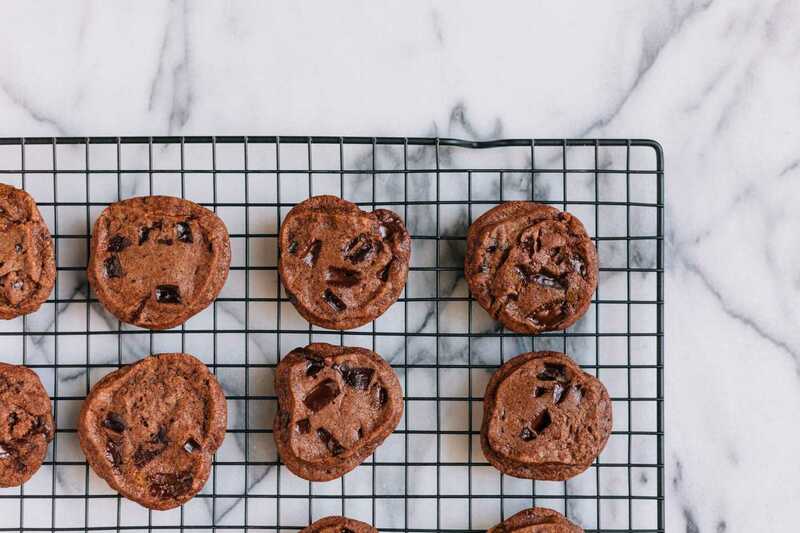 Bake for 10 to 12 minutes, or until the cookies are golden. *This cookie dough can also be frozen. Remember to take it out ahead.